Today I went looking for some things to read on long airplane rides, so of course headed to Powell’s. I thought I would get Then We Came to the End by Joshua Ferris (title from first half of first line of DeLillo’s first novel Americana), and so took a look. After reading the first page or so, I decided it was a combination of clever/cute that would get annoying over 300 pages. So I had to keep looking. I was also interested in getting Kuhn’s Structure of Scientific Revolutions which I’ve never read, and that took me over to the Technical branch. I found the Kuhn, and kept looking around… sometime I just want to find something new and weird. Finally I came across just the thing – Ether by Joe Milutis, an Art professor, the book filed in the popular science section for whatever reason. We’ll see if it’s good, but it certainly has potential, and the Amazon reviews are encouraging. Anyway, finds like this are the great thing about the random browse! From a social point of view, we ought to reserve the designation ‘technical progress’ to instances in which new tools expand the capacity and the effectiveness of a wider range of people, especially when new tools permit more autonomous production of use-values. So the question is: in what ways is the internet such a socially beneficial tool? P.S. I’ll be travelling quite a bit for the next few weeks, so postings may be light. I’d been looking forward to seeing the Dave Holland Quintet for a couple months, and last night’s concert did not disappoint! The room was not completely full, but there was a good turnout in Eugene. The band: Chris Potter on sax, Robin Eubanks on trombone, Steve Nelson on vibes, Nate Smith on drums and Dave Holland on bass. They played seven tunes, most from the last CD, Critical Mass, along with a couple new, untitled pieces. Each player got some room to really play, without falling into predictable routines of soloing. You can hear some samples of the recordings over at Dave Holland’s site (go to the Recordings). Note also that restaurants have huge markups on fancy bottled water – is it really worth it? (Note: I’m not on a crusade to outlaw bottled water or anything – I just hope people will think about it a little before spending their hard-earned wages). Saturday here in Portland, OR on NW 23rd Ave.
By Curt | Posted in Uncategorized | Comments Off on Spring! How much education? and what for? Most people who criticize our education system complain that we aren’t spending our money in the right way, or that ideologues-in-teachers’-clothes are leading our nation’s children down a dark path. While I mildly sympathize with some of these complaints, they often contradict what I see as the real problem with our educational system: There’s simply far too much education going on. The typical student burns up thousands of hours of his time learning about things that neither raise his productivity nor enrich his life. And of course, a student can’t waste thousands of hours of his time without real estate to do it in, or experts to show him how. I think one must start from some basics, for instance, what is education for? In part it’s certainly about enabling children to become productive workers, who can navigate the basics of our modern world. It’s also for socializing and interacting with other people of more or less varied backgrounds. The part about enriching people’s lives is of course a hard one to measure. In my personal experience, education has meant more to me when I had a certain goal, and particularly when I was picking up a all or part of the tab. And I definitely agree with this, quoting from John Taylor Gatto, a former schoolteacher who is fighting the system. That’s the end of an article on Gatto that you can find in full here. By Curt | Posted in Economics | Comments Off on How much education? and what for? For example, an offset purchased through the local nonprofit Climate Trust might help preserve a native forest in the Northwest, or it might help with rainforest restoration in Ecuador. Does that mean there is literally a tree out in the Ecuadorean rainforest with Joe Offset Buyer’s name on it? Not exactly. But Climate Trust does take the funds from Joe’s purchase and puts them toward replanting efforts, or one of several other causes – including one project that will help reduce carbon dioxide emissions at truck stops by allowing drivers to plug in their trucks at night rather than leave them idling. While some folks still see this as a liberal guilt-assuaging mechanism, and at its worst that may have some truth, at its best carbon offsets are means to actually dealing with the problem of carbon emissions. At this moment I suspect the biggest bang for the buck would be projects that lessen the carbon emissions from China – a recent story in the Oregonian claimed that Chinese emissions are impacting rainfall patterns on the Pacific Northwest coast! 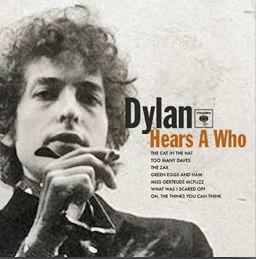 By Curt | Posted in Art, Books, Music | Comments Off on Dylan hears a Who! I’m reading this new book that centers around the murder of Theo van Gogh in Amsterdam in 2004, but ranges widely over the politics and ethnic divisions and tensions present in the Netherlands today. Van Gogh was a provocateur, and he clearly hit a nerve with some people. The earlier murder of Pim Fortuyn, a flamboyant politician who voiced concerns about the religious orientation of Muslim immigrants, made it clear that the normally placid Dutch population has a lot on its mind. Provides a history and context for what is shaping up as a primary issue in much of Europe today.